Tips for navigating law journals online and in print. As a research assistant or a journal member, you will likely need to find legal periodicals frequently. However, as a practitioner, you will want to carefully consider what sources you should be looking for. Secondary sources (journals, treatises, encyclopedias, etc.) help you research the law, but remember that they are not law. While they will orient you to a topic, they only have the potential to be persuasive in a court of law. Periodicals are geared towards deep dives on certain topics and academic/background research. Are you searching for a specific journal article or are you searching generally for articles on certain subjects? The good and bad news is the same: there are many places and ways to locate these materials, but that can make it difficult to determine how and where to search. It is easiest to begin this process with a complete citation. If you are missing information and struggling to fill it in, come see a reference librarian. Do you need it in print or electronically? If electronically, do you need in its original form (as a PDF document) or is online text sufficient (i.e., Westlaw)? For print journals, the process is simple. Access the Law Library's catalog. Search by title for the name of the journal. After you select the journal you want, you can see the years that the library has on shelf. Note that if we have online access to the journal through the HeinOnline Law Journal Library, you can access it here. Local law reviews are typically situated in the first floor reading room; all other journals are on the third floor of the library. 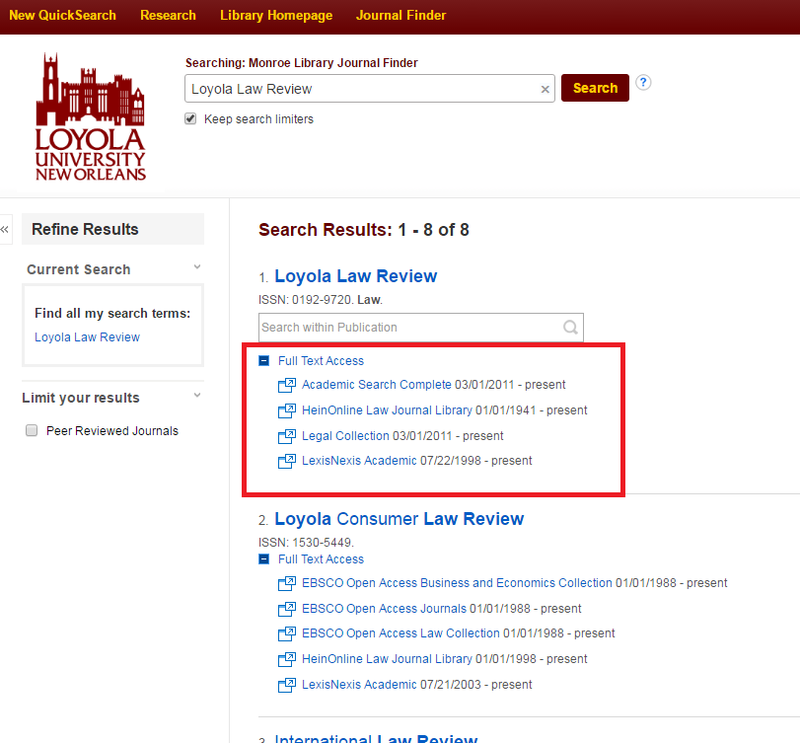 If the journal is not available in our library, check the main campus library's catalog at library.loyno.edu. Repeat the process used in the law library catalog. Law students have full access privileges at the main library. If the journal is not available from Loyola, check Tulane's libraries: the Law Library and Howard-Tilton (main campus library). At this time, students may check out books from the Tulane Law Library, use the free book scanner in the Tulane Law Library, or buy a Tulane copy-card for either library. Ask at the circulation desk for more information. If the journal is still not available, request an Inter Library Loan (ILL). Instructions can be found at the Law Library's website, http://law.loyno.edu/ill-instructions, or speak to a staff member at the circulation desk on the first floor. Law Library Journal - HeinOnline. Has scans of over 2,000 journals, domestic and foreign. Can search full text, by author, journal title, article title, year, subject, etc. **Note on access: these databases are available for all Loyola students and faculty. Some of these databases you must be on campus - connected to campus internet. Other databases may be accessible off-campus and will ask you to login before you can view an article. The login information is the same used to log into your LoyMail accounts. It is possible to search for journal articles by subject in print. It is not as easy as electronic searching that you are likely already familiar with. You'll want to use an index to periodicals, which will allow you to search by subject matter for articles printed in a particular year. Some indexes will also allow you to search for articles that discuss specific cases, statutes, by author, and by article title. Here are some recommendations, but if you have more specific questions about researching journals in print, talk to a law librarian; both of these indexes are on the third floor, on top of the study carrels near the elevator. Current Law Index: includes articles published in the US, UK, Australia, Ireland, and New Zealand. Index to Foreign Legal Periodicals: includes articles published outside of the US, the UK, and the British Commonwealth. The easiest and most common way to search is electronically. Although it is simple, there are many options. When you first start research in law school, play around with the different options to see what works best for you. In practice, you may be more limited by the resources at your disposal. Monroe Library, the main library of Loyola, has access to several databases with access to academic journals. On the library's main webpage, library.loyno.edu, you can type a phrase in the quick search box, which will search all of the print and electronic resources available. This option will likely give you more results than you need. You can narrow your search using the options on the side menu (type of publication, year, subject, etc.) or you can start with an advanced search and choose these options before running your search. To search only law journal articles, you may want to start with the Law Journal Library through HeinOnline. You can do a quick search that will immediately search all text or an advanced search. Although it limits your search compared to the Monroe databases, there are other features that help with your research. For example, if a footnote is to material also on Hein, you can click the footnote and be brought to the source. Using the Hein search results, you can see how many times an article has been cited and what has cited it. Westlaw and Lexis Advance: You can search for journal articles on Westlaw and Lexis Advance. I don't typically recommend this, typically because the journals are limited historically, and there is more likely to be errors in the replication of the article. Further, once you leave law school, your access to these databases will likely be limited. Even if you work for a large firm, you will need to limit the amount of time you spend searching because it is expensive. However, these are great databases for searching - particularly useful if you are moving in between secondary sources and case law. When looking at a case on Westlaw, select "Citing References" from the top menu, then narrow to secondary sources, then law reviews and journals. On Lexis, select "Other Citing Sources" on the right-hand side, then narrow by law reviews. If you do use these to only search for journal articles, first be sure to narrow the content to law reviews and journals - on either database, select "secondary sources" in the content box on the top of the page. 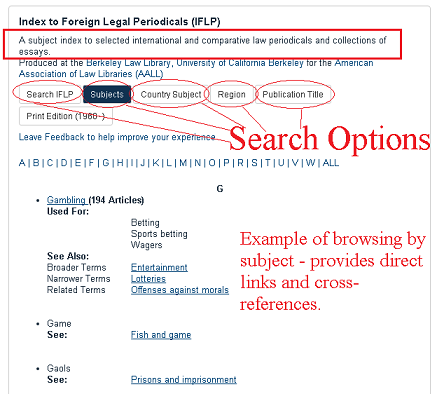 Using Index to Foreign Legal Periodicals (IFLP) through HeinOnline: There are strengths and weaknesses depending on exactly what are you looking for. The IFLP is great if you are researching foreign/comparative/international law or looking for that kind of perspective because of the types of articles it includes and also because you can search by country subject or by geographic region. Using an index can take some adjustment because you have to use a "controlled vocabulary" - this means there is a list of subjects to search by, rather than creating the search term on your own. After selecting a subject, the search results list every article that discusses that subject. It can be further narrowed by year, language, publication, country of publication, overlap with another subject, etc. If the article is available elsewhere on HeinOnline, there will be a direct link to the text. If it is not available, follow the steps on finding a specific journal article. REMEMBER: One of the most important considerations for electronic searching is the words you use to conduct your search. If you need help determining search terms, talk with a law librarian.